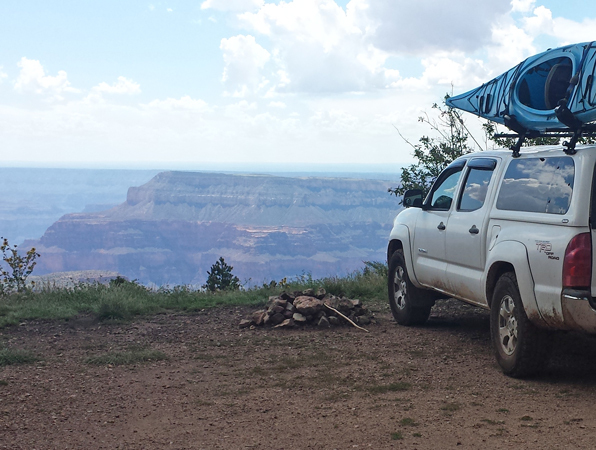 One of our adventures while camped on the North Rim was to travel out to Indian Hollow and Monument viewpoints. I was interested in those two because each was at the trailhead of an inner Grand Canyon hiking trail. 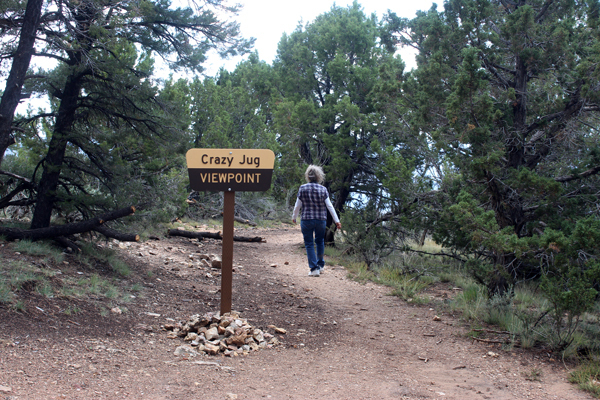 Crazy Jug point was added to the mix because we had to pass by there to get to the Monument overlook. These are all westside viewpoints located approximately 25 miles southwest of Jacob Lake. We were camped near Jacob Lake so our original plan was to travel FDR462 to FDR22. 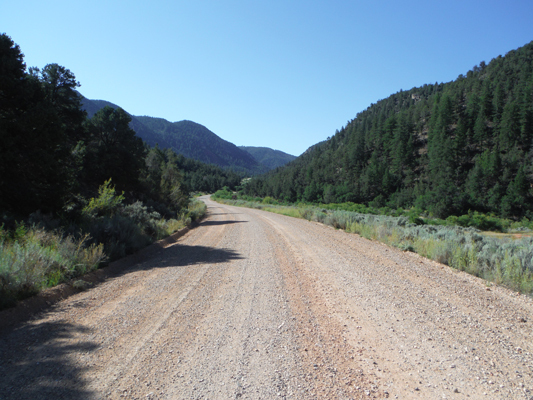 FDR 22 is a well-maintained, high speed gravel road. After a dusty encounter with a logging truck on the 22 road, we studied our maps for a "quieter" route down to the viewpoints. The decision was made to swing over to the west a bit and use the FDR 423 road instead. At the intersection of the 642 road and the 423 road, this sign caught our attention. There was a small ridge with several wide switchbacks to climb just past the sign, but nothing that an experienced driver would probably even notice....We had been looking forward to a bit more excitement. 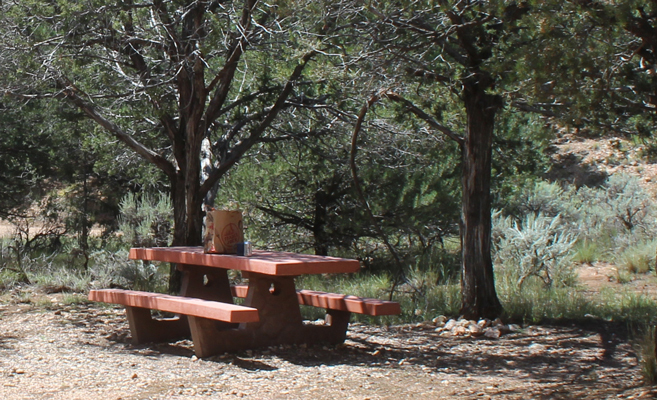 The Indian Hollow campground is a small developed area with 3 tables and a toilet. There is some shade under the pinyon pine and juniper trees. The campground is not at the viewpoint. The road continues on past the campground approximately a 1/2 mile. 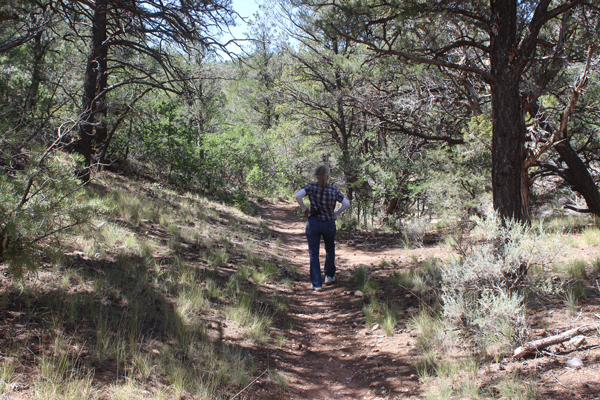 From the end of the road, a hiking trail climbs for about a 1/4 mile to the Canyon's edge. 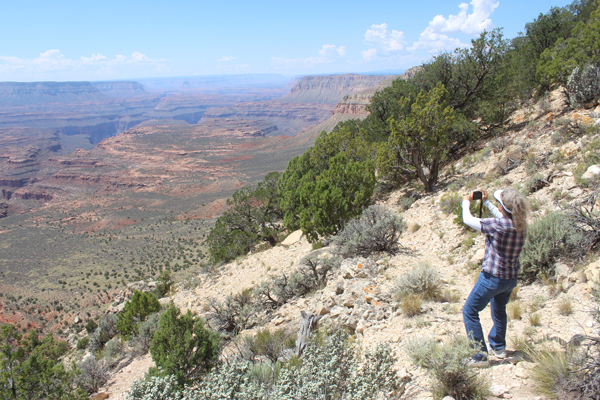 That is the location of the Indian Hollow View Point and from there are the first views of the Grand Canyon. 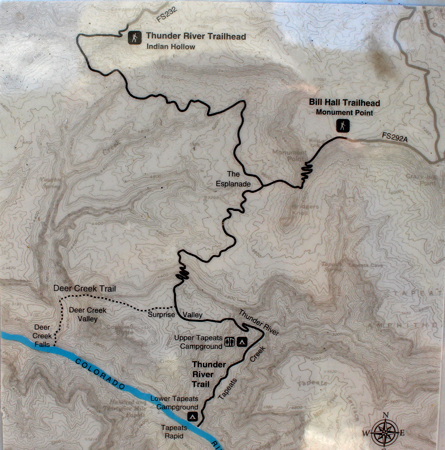 The Thunder River Trailhead at Indian Hollow Viewpoint. One of the Canyon views from the Indian Hollow Viewpoint. 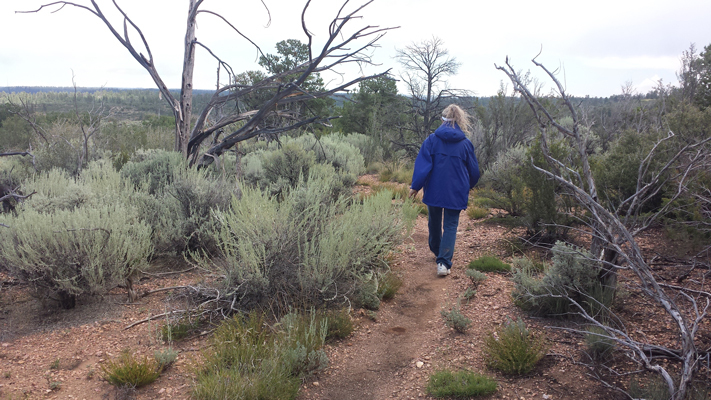 The upper part of the Thunder River trail is described as an old livestock trail. 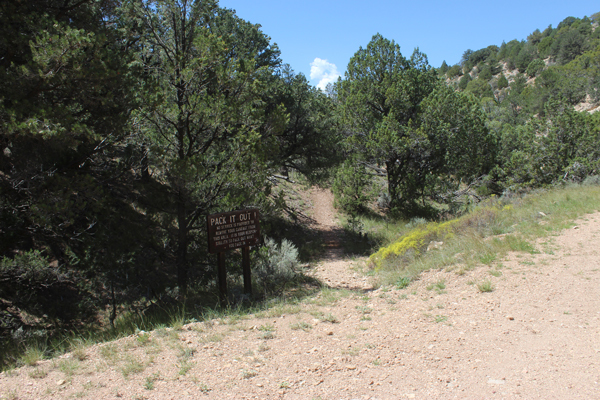 In approximately 5 miles, it merges with the Bill Hall Trail which comes off the rim to the east. 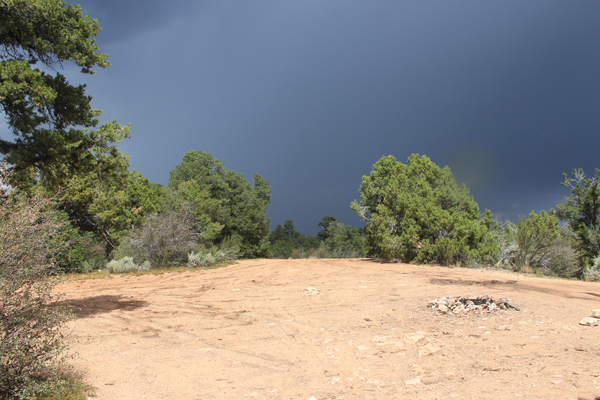 The trail continues on past Thunder River, the world's shortest river. It ends on the banks of the Colorado River. At least at the top, the Thunder River Trail is not well defined. It began to rain on us as we left Indian Hollow. By the time we had reached the 425 road, the 232 road was getting a little slick. I do not know if I would be out on that road without four wheel drive if much rain was forecast. The 425 seemed to maintain its integrity a bit better, but was slippery in a couple of places. 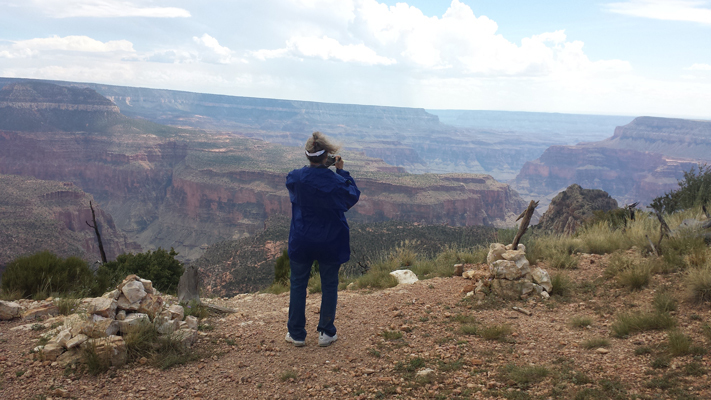 This is a view into the canyon from Crazy Jug Point. While at Crazy Jug we could see another storm building to the east of us. We decided to make a run on to Monument Viewpoint. Our hope was that the storm would bypass us. 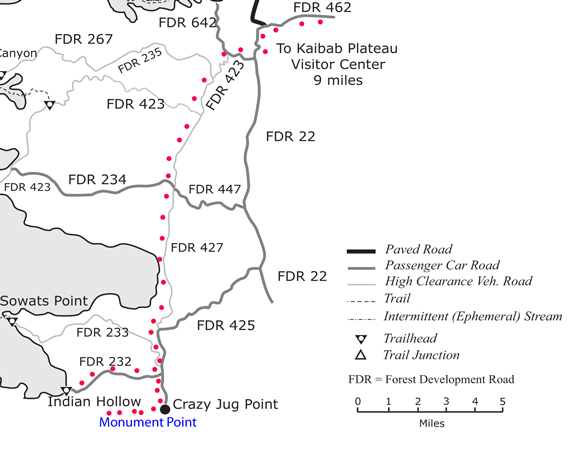 The 1.5 mile long road from Crazy Jug Point west to Monument Point runs very close to the edge of the canyon. Unfortunately, because of the weather, we were not able to stop as often as we would have liked. We did pause to have the truck pose for the scene in the top photo of this report. This is the Google Earth View of the road between the two points. 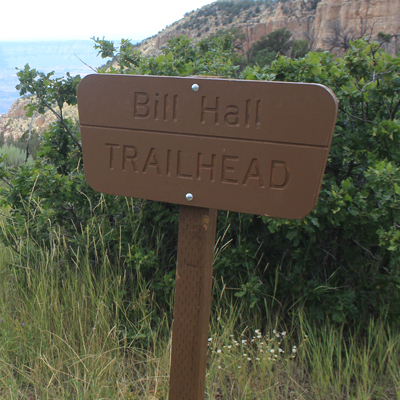 The Bill Hall Trailhead is located near Monument Point. This trail presents a shorter, but more strenuous, route to the Thunder River area than the Thunder River Trail over at Indian Hollow. Bill Hall was a ranger who was killed in an automobile accident in 1979. 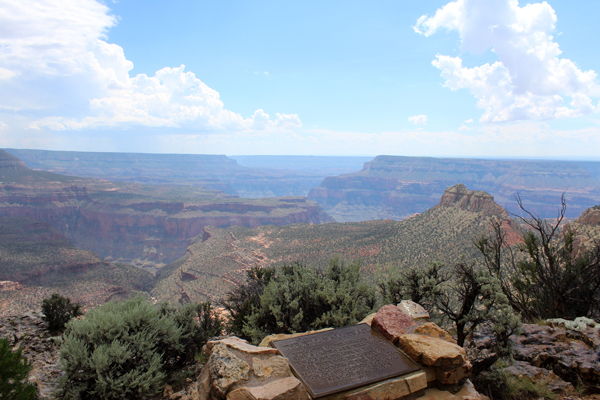 A memorial plaque has been installed on a short spur at the canyon's edge. The Bill Hall Trail wanders for a half mile or so to the west along the rim before it takes the plunge into the canyon. 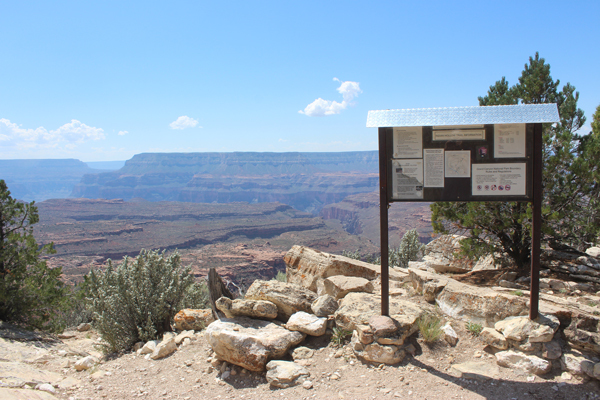 This gives visitors to the point a chance to stretch their legs a bit without having to commit to a steep climb down or back up the canyon trail. The Canyon View from the Bill Hall Trail near Monument Point. We returned to our camp via Forest Road 22. Along the way we passed the large Forest Service Administrative Site at Big Springs. 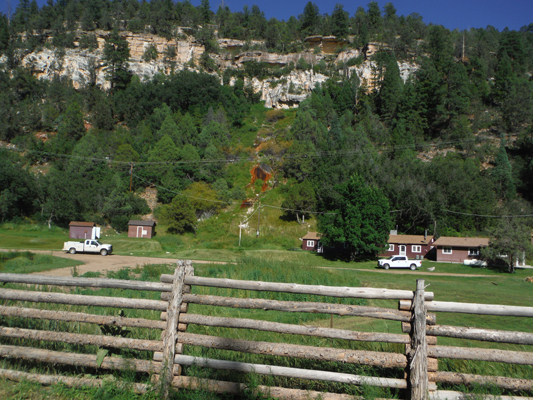 The run-off from the springs has stained a large area on the mountainside. 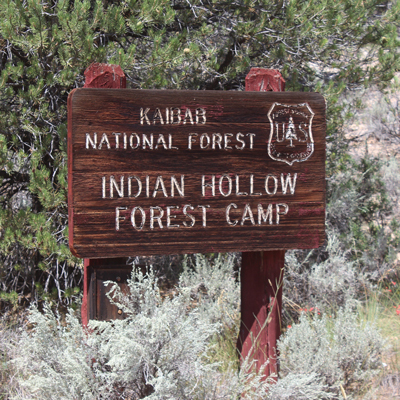 Big Springs is described as the most "abundant" spring on the Kaibab Plateau. There are several spring fed ponds at the site. 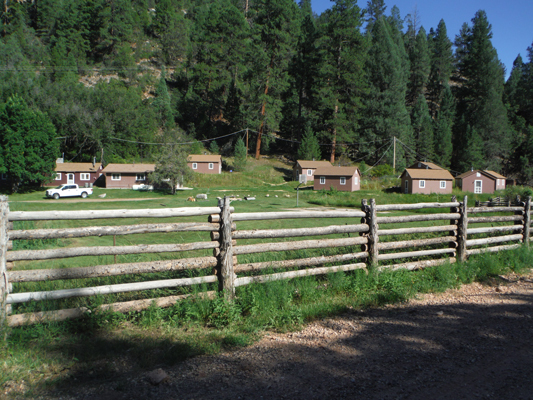 Seven historical cabins that appear to have been used for employee housing are now available for rent. The rate is around $65 per night.